I came across a short memoir written by Gabriel Garcia Marquez recently, and fell in love with it so much I ended up translating it into English. And just as he describes, Caracas has snuck its way into my heart slowly over the last few months. What he says is true, especially in today's uncertain political climate: it's hard to be happy thinking of Caracas, but it's impossible not to think about it. I've included the original Spanish version after the English translation. The first time I heard of it was in a quote by Simon Bolivar: Unhappy Caracas. Since then, I’ve rarely heard the name spoken without being preceded by the tired prestige of unhappiness. It seems the city’s fate is the same as many people’s under great strain, who cannot be loved but for those capable of suffering through it. Since that remote primary school phrase, Caracas has been much like an obsession for me. In the town where I was born, which also had something of hell (and not only for its hellish heat) one would encounter Caracas in the water and salt. It was a haven for expatriates and stateless persons around the world, but there existed a group apart, much more ours than the others, who were fugitives from the hell of Juan Vicente Gomez. They left me with Caracas forever stamped on my heart, sometimes in the horrors of its prisons, and sometimes with the idealization of nostalgia. It was hard to be happy thinking of Caracas, but it was impossible not to think about it. No one taught me as much about that unreal city, as the old woman who filled the happiest years of my childhood with her stories. She was called Juana de Freites, and was intelligent and beautiful, and a person more human and with more sense of drama than any I ever knew. Every afternoon, when the heat subsided, she sat in the doorway of her house in her rocker with snowy hair, wrapped in her dressing gown, and told us the great stories of children’s literature. The usual suspects - from Snow White to Gulliver’s Travels - but with one change from the original: all took place in Caracas. That was how I grew up with the magic certainty that Genevieve of Brabant and her Unfortunate Son took refuge in a cave in Bello Monte, that Cinderella had lost her slipper at a gala in El Paraíso, that Sleeping Beauty was waiting for her prince in the shadow of Los Caobos, and that Little Red Riding Hood was eaten by a wolf named Juan Vicente, the Ferocious. Since then, Caracas was to me the fugitive city of the imagination, with castles of giants, genies hidden in bottles, singing trees and fountains that turned hearts into toads, and wonderful girls that lived in the world on the other side of the mirror. Unfortunately, nothing is more horrendous or raises more misfortunes as the combined world of fairy tales, so my earliest memories of Caracas remained unchanged: Unhappy Caracas. All this was on my mind on December 28, 1957 - the Day of the Holy Innocents - while flying from Paris to Caracas in the paper airplanes of the time, which was a trip long enough to give me much time to think. Despite the heat, the roar of traffic on the highways, the world’s longest short distances, I recognized with every turn of the wheel the familiar places of my childhood as if I wasn’t seeing them for the first time. I recognized on the steep slopes colored huts belonging to dwarves, dragons made from candles, the tower of the king, and a demonic building that just by its name surpassed from afar all horrors of my child’s world: the Helicoide de la Roca Tarpeya. 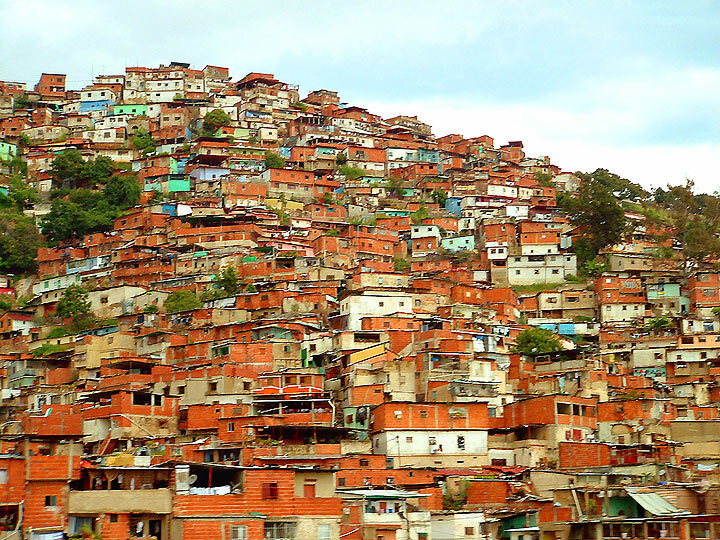 I remember seeing it for the first time, peering at the deadly precipice, and remembering again: Unhappy Caracas. My first Sunday in the city I woke up with the singular feeling that something strange was going to happen, and I attributed it to the mood inspired in me by the fables of Juana de Freites. A few hours later, as we prepared for a lovely Sunday at the beach, Soledad Mendoza raced up the stairs in two strides of her Seven League boots. “The air force has risen!” - she shouted. Indeed, 15 minutes later, the city unfurled completely in its natural state of literary fantasy. The Caracans had taken to the rooftops, waving jubilant handkerchiefs at the battle planes and clapping with joy as they saw bombs fall on the Miraflores Palace, which for me was still the Castle of the Mad King. Three months later, Venezuela was briefly, but unforgettably in my life, the freest country in the world. And I was a happy man, perhaps because never since then had so many singular things occurred in a single year: I got married, I lived a revolution in the flesh, I set a direction for my life, I spent three hours stuck in an elevator with a beautiful woman, I wrote my best story for a contest I did not win, I defined forever my concept of literature and its secretive relationship with journalism, I drove my first car and had an accident two minutes later, and I acquired a clear political view which would cause me twelve years later to join a Venezuelan party. Maybe that’s why one of the beautiful frustrations of my life is not to have stayed forever in this infernal city. I like the people, and we are very much alike, I like the tender and brave women, I like the madness without limits, and the experimental way of finding meaning in life. There are few things I like as much in this world as the color of the Avila at sunset. But the greatest miracle of Caracas is that amid the iron and asphalt and traffic jams that have not changed in 20 years, the city still preserves in its heart nostalgia for the countryside. There are evenings of spring sunshine when you can hear the cicadas more clearly than the cars, and one sleeps on the fifteenth floor of a glass skyscraper, dreaming of singing frogs and the sound of crickets, and despairs on waking in the thundering dawn, which still is purified every morning by the crowing of a rooster. It is the reverse of the fairytales: Happy Caracas. La primera vez que la oí nombrar fue en una frase de Simón Bolívar: La infeliz Caracas. Desde entonces, pocas veces la he vuelto a oír nombrada sin que vaya precedida de ese antiguo prestigio de infelicidad. Al parecer, su destino es igual al de muchos seres humanos de gran estirpe, que no pueden ser amados sino por quienes sean capaces de padecerlos. Desde aquella remota frase de la escuela primaria, Caracas ha sido siempre para mí algo muy parecido a una obsesión. En el pueblo donde nací, que también tenía algo de infernal y no sólo por su calor de infierno, uno se encontraba a Caracas en el agua y la sal. Era un refugio de expatriados y apátridas del mundo entero, pero existía una categoría aparte, mucho más nuestra que las otras, que eran los fugitivos del infierno de Juan Vicente Gómez. Ellos me dejaron a Caracas sembrada para siempre en el corazón, a veces por los horrores de sus cárceles, y a veces por la idealización de la nostalgia. Era difícil ser feliz pensando en Caracas, pero era imposible no pensar en ella. Nadie me enseñó tanto sobre esa ciudad irreal, como la gran mujer que pobló de fantasmas los años más dichosos de mi niñez. Se llamaba Juana de Freites, y era inteligente y hermosa, y el ser humano más humano y con más sentido de la fabulación que conocí jamás. Todas las tardes, cuando bajaba el calor, se sentaba en la puerta de su casa en un mecedor de bejuco, con su cabeza nevada y su bata de nazarena, y nos contaba sin cansancio los grandes cuentos de la literatura infantil. Los mismos de siempre, desde Blanca Nieves hasta Gulliver, pero con una variación original: todos ocurrían en Caracas. Fue así como crecí con la certidumbre mágica de que Genoveva de Bravante y su hijo Desdichado se refugiaron en una cueva de Bello Monte, que Cenicienta había perdido la zapatilla de cristal en una fiesta de gala de El Paraíso, que la Bella Durmiente esperaba a su príncipe despertador a la sombra de Los Caobos, y que Caperucita Roja había sido devorada por un lobo llamado Juan Vicente el Feroz. Caracas fue desde entonces para mí la ciudad fugitiva de la imaginación, con castillos de gigantes, con genios escondidos en las botellas, con árboles que cantaban y fuentes que convertían en sapos el corazón, y muchachas de prodigio que vivían en el mundo al revés dentro de los espejos. Por desgracia, nada es más atroz ni suscita tantas desdichas juntas como la maravilla de los cuentos de hadas, de modo que mi recuerdo anticipado de Caracas siguió siendo el de siempre: la infeliz Caracas. Todo esto lo pensaba el 28 de diciembre de 1957 – día de los Santos Inocentes, además – mientras volaba desde París hacia Caracas en los aviones de cuerda de aquella época, que tanto tiempo daban para pensar. A pesar del calor, del fragor del tránsito en las autopistas de vértigo, de las distancias cortas más largas del mundo, yo iba reconociendo a cada vuelta de rueda los sitios familiares de mi infancia desde que atravesé la ciudad por primera vez. Identificaba en las laderas escarpadas las cabañas de colores de los enanos, los dragones de candela, la torre del rey, y una edificación luciferina que sólo por su nombre sobrepasaba de muy lejos a todos los horrores del mundo infantil: El Helicoide de la Roca Tarpeya. Recuerdo que al verla por vez primera, asomada a su precipicio mortal, volví a recordar: La infeliz Caracas. Mi primer domingo en la ciudad desperté con la rara sensación de que algo extraño nos iba a suceder, y la atribuí al estado de ánimo que me había inspirado con sus fábulas doña Juana de Freites. Pocas horas más tarde, cuando nos preparábamos para un domingo feliz en la playa, Soledad Mendoza subió de dos zancadas las escaleras de la casa con sus botas de Siete Leguas. -¡Se alzó la aviación! – gritó. En efecto, quince minutos después, la ciudad se abrió por completo en su estado natural de literatura fantástica. Los caraqueños habían salido a las azoteas, saludando con pañuelos de júbilo a los aviones de guerra y aplaudiendo de gozo cuando veían caer las bombas sobre el Palacio de Miraflores, que para mí seguía siendo el Castillo del Rey que Rabió. Tres meses después, Venezuela fue por poco tiempo, pero de un modo inolvidable en mi vida, el país más libre del mundo. Y yo fui un hombre feliz, tal vez porque nunca más desde entonces me volvieron a ocurrir tantas cosas definitivas por primera vez en un solo año: me casé para siempre, viví una revolución de carne y hueso, tuve una dirección fija, me quedé tres horas encerrado en un ascensor con una mujer bella, escribí mi mejor cuento para un concurso que no gané, definí para siempre mi concepción de la literatura y sus relaciones secretas con el periodismo, manejé el primer automóvil y sufrí un accidente dos minutos después, y adquirí una claridad política que habría de llevarme doce años más tarde a ingresar en un partido de Venezuela. Tal vez por eso, una de las hermosas frustraciones de mi vida es no haberme quedado a vivir para siempre en esa ciudad infernal. Me gusta su gente, a la cual me siento muy parecido, me gustan sus mujeres tiernas y bravas, y me gusta su locura sin límites y su sentido experimental de la vida. Pocas cosas me gustan tanto en este mundo como el color del Avila al atardecer. Pero el prodigio mayor de Caracas es que en medio del hierro y el asfalto y los embotellamientos de tránsito que siguen siendo uno solo y siempre el mismo desde hace 20 años, la ciudad conserva todavía en su corazón la nostalgia del campo. Hay unas tardes de sol primaveral en que se oyen más las chicharras que los carros, y uno duerme en el piso número quince de un rascacielos de vidrio soñando con el canto de las ranas y el pistón de los grillos, y se despierta en unas albas atronadoras, pero todavía purificadas por los cobres de un gallo. Es el revés de los cuentos de hadas: la feliz Caracas.